Kendrick Lamar’s video for “Humble,” off his still-untitled new record which may be coming out this Friday, got people talking in a way few videos do. (At least, few videos by people not named Beyoncé.) 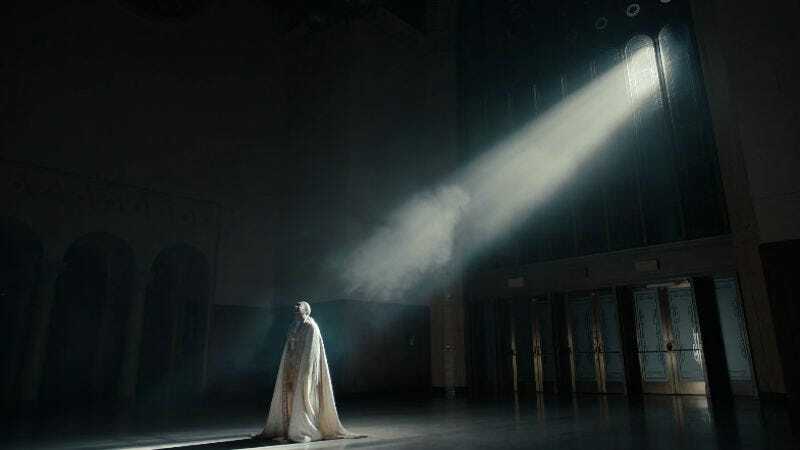 It’s a provocative, visually sumptuous clip, elevating the straight-forward bounce of the beat and Kendrick’s furious lyrical performance to something operatic. It’s not just the audacity of the imagery—commingling Catholicism, vanity, and violence, like an early-’90s Madonna video—but the sheer sumptuous quality of the visuals. It was actually shot several times, each time rearranging all of the men, and then digitally edited to mix them all up and make the crowd look bigger. The image of Kendrick riding his bike through some sort of tiny world was actually made using a 360-degree camera of the sort typically used for VR, mounted high atop his bike. You can see the shadow for the pole that held it up on the pavement. And that image of him under a bridge with the camera soaring all over the place? They used a crane that swirled all around him. Even though it looks inhuman, that thing was done in one shot with no digital effects. Watch the whole thing below, then impress all your friends with your newfound technical expertise.